Being comfortable in the agency business is a recipe for failure. This is especially true if you run the business. If you’re not looking 5-10 years ahead, well, good luck to you. With a clear eye toward the future, Saxum recently began a significant transformation. It involves moving mountains, wildly important goals, and a life-changing trip around the world by yours truly. Let’s start with that last one. I’ve learned a lot about people over the years. I’ve learned that most people don’t do the bold things that they once dreamed of doing. Most aren’t willing to step back from the whirlwind and plan their future. Having run my agency for 15 years, I knew it was time to step outside my whirlwind and take a hard look at the road ahead. A little over a year ago, I took a rather extreme sabbatical with my family. We sold our house. We sold our cars. We sold 90% of our possessions. (My lawyer said he’d never had a client do an estate sale who was still alive.) We packed what we needed into carry-on suitcases, and for five-plus months we traveled the world. It was a transformational experience. Among many revelations the trip produced was a fresh perspective on my business, the potential of my colleagues, and what’s important in life. The changes at Saxum began by us zeroing in on the things we’re good at. We call this “moving mountains,” as in ‘will the work make a difference in the world? 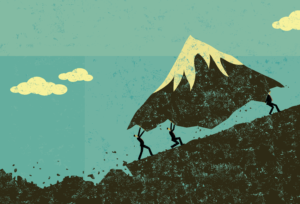 Is it worth moving mountains for?’ We’ve categorized our work into six mountains that we think are worth moving: Criminal justice reform, place-making, and education reform – those mountains built around our social issues group. We also have disruptive solutions, infrastructure, and energy. Inspired by the book “The Four Disciplines of Execution: Achieving your Wildly Important Goals,” I started mapping out Saxum’s future with the help of a WIG strategy. Strategy is essentially a set of choices. However, when we’re making strategic decisions there is always other stuff going on. This is called a whirlwind, which is defined as work that’s important and urgent. The authors of the book claim that the ultimate growth strategy is to spend more time on the “not urgent,” but important items. I challenged our team to press pause and to think hard about the important, urgent work that we’re doing and to question whether it fits into our overall agency strategy. That’s what setting a Wildly Important Goal (WIG) is about. Our agency’s WIG is to reduce the number of clients we serve. Yes, you read that correctly. In 2017, Saxum invoiced 127 clients in a period of one year. The ugly truth is that 60% of those clients made up a very small percentage of our agency revenue. Our WIG is to bill 85 clients over a one-year period while also doing away with monthly minimum retainers, instead of setting a total revenue average goal for each client. This approach has changed the way we look at new opportunities and how we integrate all our clients into our agency WIG. I feel fortunate to have been able to change my scenery for a few months, to alter my perception, and to have a chance to think deeply about the future of our agency. You don’t need to sell your house and travel the world to accomplish this, but I certainly enjoyed my journey – and I’m excited about our agency’s path ahead.